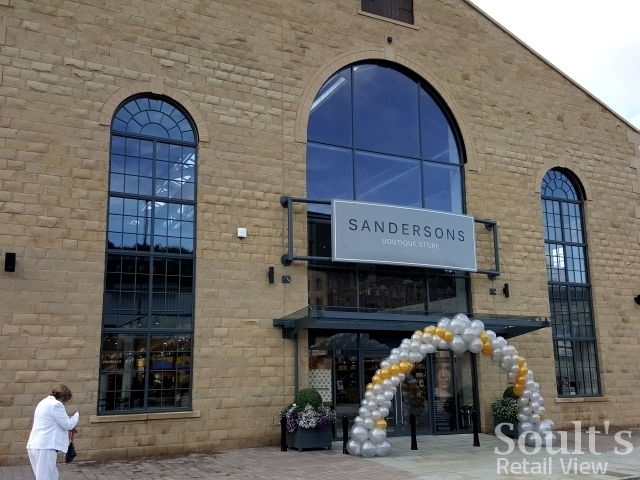 It’s a few weeks since I trailed the opening of Sandersons in Sheffield, a new and independent 17,000 sq ft boutique department store that acts as one of the anchors of the Fox Valley scheme at Stocksbridge. Having visited the store for its launch on 1 September, I’m pleased to say that Sandersons lives up to its promise – and then some. To recap, Sandersons is unusual in that it has essentially come about through a shopping centre developer turning itself into a retailer as well. The store’s founder and MD Deborah Holmes is also the co-owner of Dransfield Properties Ltd, the company behind Fox Valley as well as established schemes elsewhere like Gainsborough’s Marshall’s Yard and Morpeth’s Sanderson Arcade (from which, incidentally, the new department store takes its name). On the face of it, an untested retailer opening an untested concept in an unestablished retail location – especially in the current retail market – is a pretty brave move. However, Dransfield has never been afraid to do things its own way. It has built up enviable networks and market knowledge over the years, as well as a string of well-regarded and successful retail-led schemes. 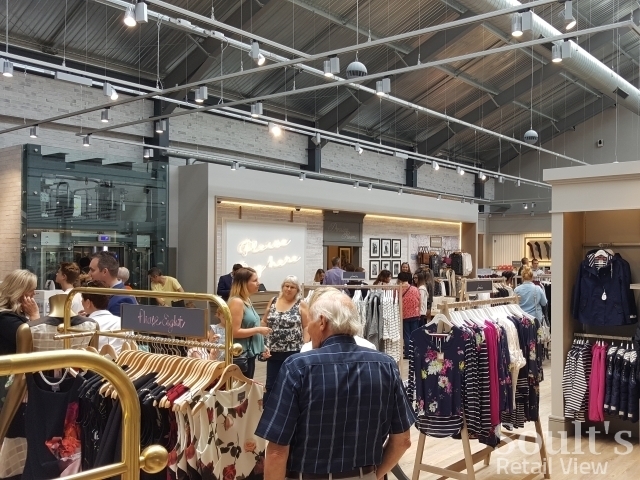 Indeed, as I reported before, Sandersons has tapped into expertise from established independent department stores Browns (of Gainsborough), Rutherford’s of Morpeth and Barkers of Northallerton in order to develop its concept. 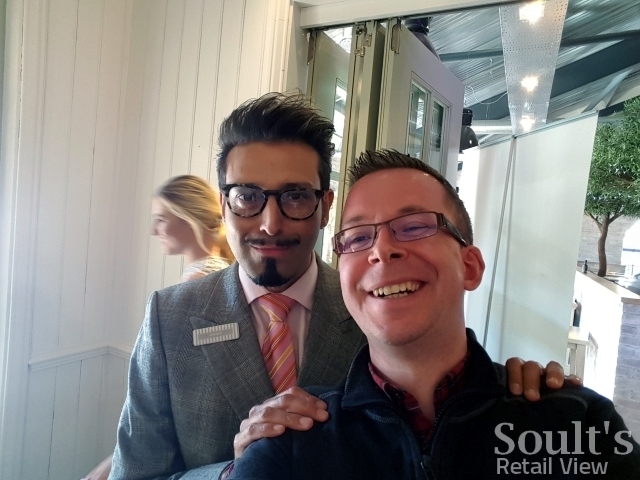 Both Barkers and Rutherford’s were at the Sandersons store opening to offer their support, and I was somewhat starstruck to end up having a conversation with Guy Barker and Richard Rutherford at the same time – two of my independent retail heroes! So, on to the store itself. Regular readers will know that I’m big on retailers making a great first impression – and how to build kerb appeal is a topic I’ve covered in my writing and in my talks time and time again. Happily, Dransfield is known for its attention to detail when it comes to design, landscaping and housekeeping, and Sandersons is no exception. The building’s frontage is imposing, and the planters by the entrance add a welcome splash of colour and visual appeal. As I highlighted previously, one of the interesting things about Fox Valley is that while the scheme might look like it’s a series of converted warehouses, all the retail buildings are, in fact, completely new build. For Sandersons, the building’s design means that there is no shop window to speak of – unusual for a department store – but the extensive glazed entranceway offsets this by ensuring plenty of good views into the store. Sandersons’ prime position at the entrance to Fox Valley, and overlooking the public square, also means that pedestrians and vehicles entering the scheme have no option but to pass it. It’s inside the shop where the double-height glazing really comes into its own, creating a light, welcoming and impressive space – as shown in the video below – that has more in common with a New York loft than the traditional expectations of a department store. That’s certainly no bad thing, though. With a plethora of competing entrances, floors and concessions, entering a department store for the first time can often be a confusing experience for the consumer. One of the nice things about Sandersons, though, is the store’s legibility and ease of navigation. Even before they admire they double-height space that they’ve walked into, customers stepping through the door can be in no doubt that they’ve arrived somewhere different and interesting. As shown above, the chrome-faced frontage of the Inglot make-up counter is the first thing that you see, boldly announcing Sandersons’ (and Fox Valley’s) presence. 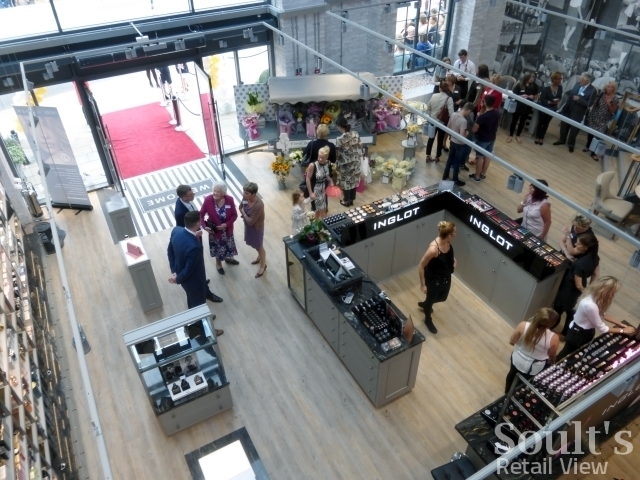 Meanwhile, flower cart Floral Boutique and nail technician The Nail Box – both positioned near the entrance – immediately showcase how Sandersons is championing local and independent brands and services. A lack of clutter allows for tantalising glimpses into the rest of the store’s ground floor as well, which houses the beauty, accessories, footwear (by Moda in Pelle) and menswear departments. 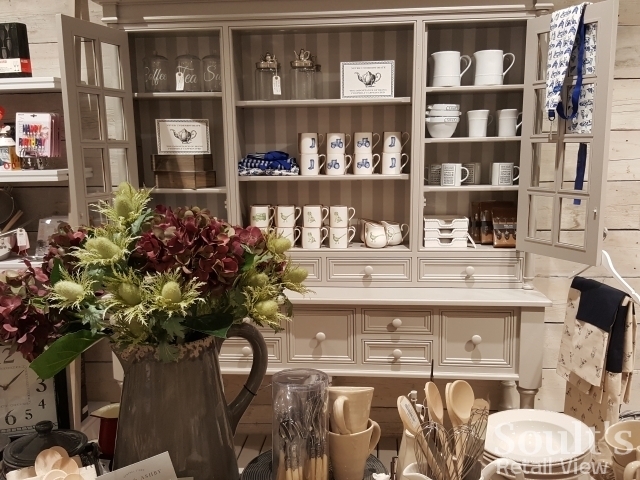 There’s also a small but interesting home department that has at least a flavour of Rutherford’s influence, with merchandise displayed on pieces of furniture rather than traditional retail fixtures. 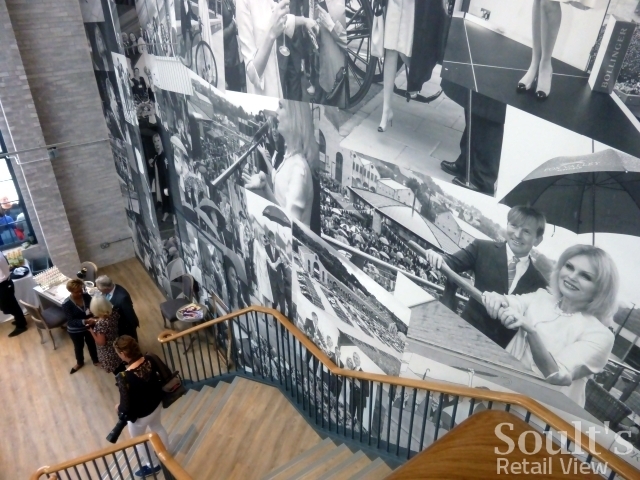 To the left of the entrance, it’s hard not to be drawn to the so-called ‘Wall of Fame’, a montage of black and white images from Fox Valley’s June opening – including guest of honour Joanna Lumley – that runs the full height of the staircase leading up to the mezzanine level (where the instore café and extensive womenswear department are found). The ‘Wall of Fame’ montage is a bold statement of how integral Sandersons is to the Fox Valley scheme, and a nice touch to celebrate many of the local people who braved the rain to be there for the Phase 1 launch back in June. 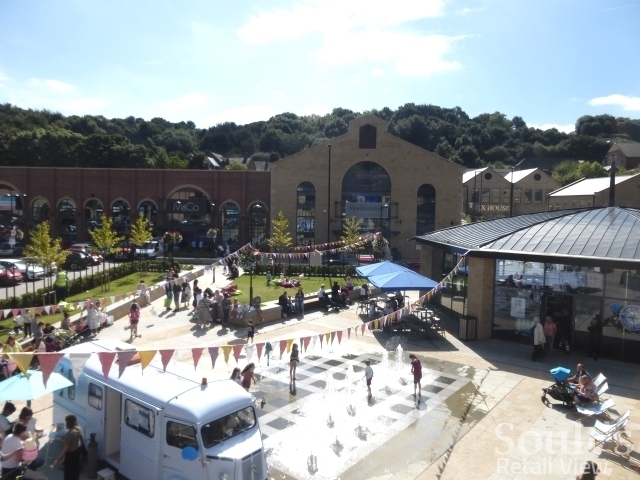 After all, the Fox Valley development is constantly treading this delicate line – successfully, I would argue – of wanting to be rooted in the local Stocksbridge community at the same time as attracting shoppers who would never have thought of visiting the town previously. 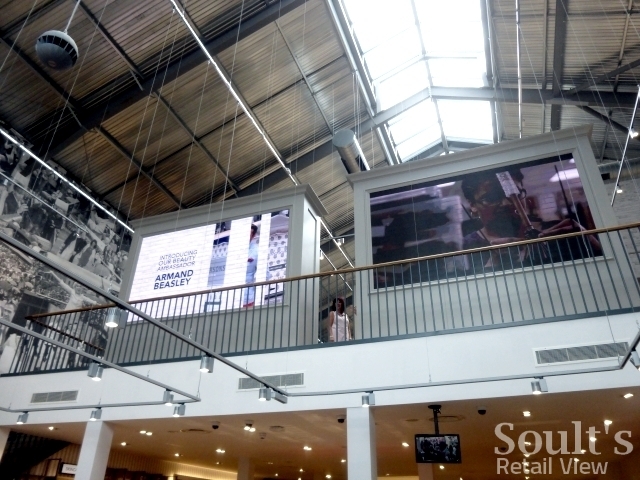 A duo of digital screens, positioned at the front of the mezzanine, also catch the eye upon entering the store, using what would otherwise be a blank space to trail some of Sandersons’ offers and attractions. 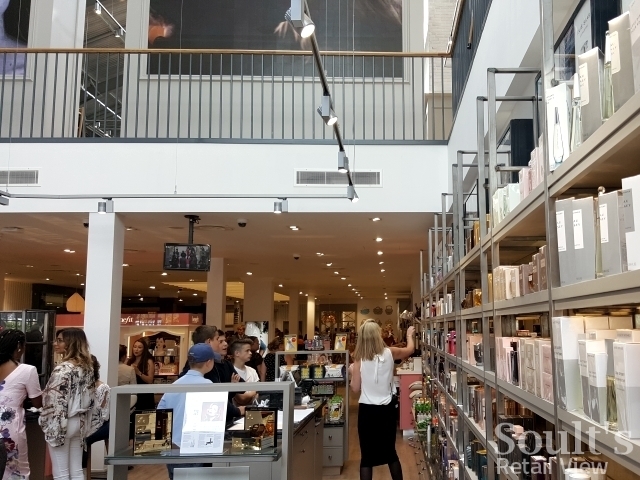 As well as performing a practical function, the presence of the screens is very much another indication that Sandersons is a physical store with a strong underlying digital savviness. 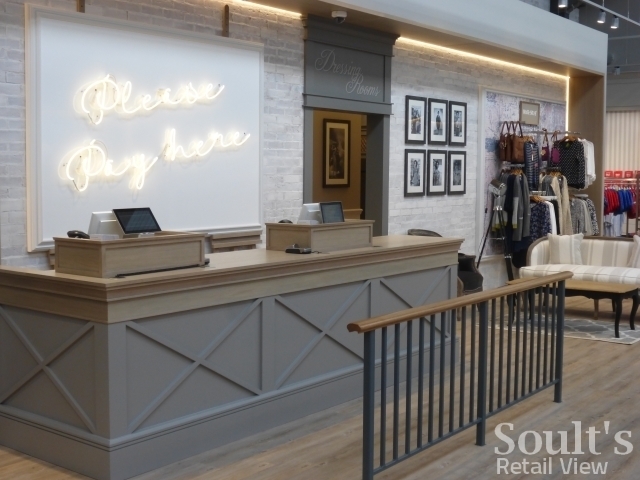 In a previous blog, I noted how Fox Valley has achieved the impressive feat of signing up a mix of value and premium retailers – Aldi and Poundworld alongside Seasalt and JoJo Maman Bébé, for instance – together with some interesting independents and attractive leisure operators. Now, Sandersons has pulled off much the same trick within the confines of its store, to collate an offer of brands and experiences that is immediately distinctive and eye-catching. 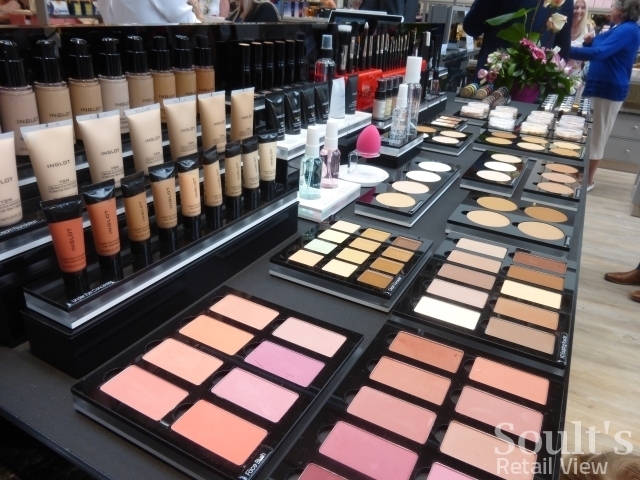 So, the usual cosmetics names that you find in every other department store or Boots branch are eschewed in favour of brands like Inglot, a Polish cosmetics company with stores worldwide, and whose UK physical presence was previously limited to London. Similarly, Essex-based ethical skincare brand SKN-RG, which has a counter at Sandersons, is typically found in spas and salons but rarely in stores. For any beauty retailer, bringing in less familiar brands over those that shoppers recognise is a potentially risky strategy. However, Sandersons’ calculation is clearly that shoppers wanting the usual brands can already head to Meadowhall or Sheffield city centre. 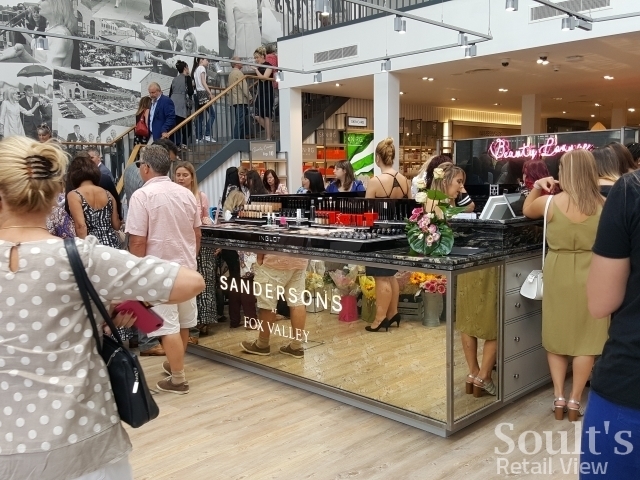 Being different and distinctive is what will ultimately make Sandersons – and indeed Fox Valley – a retail destination that can compete with what else is on offer in South Yorkshire. 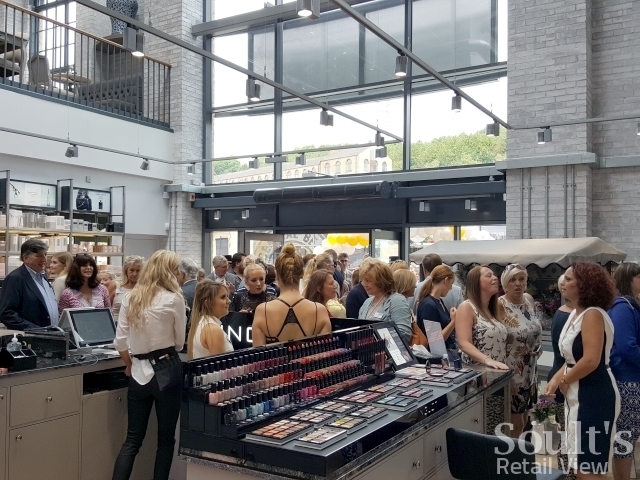 Crucially, the store’s Beauty Ambassador, celebrity make-up artist Armand Beasley, has curated the beauty offer, so he and his team in the ‘Beauty Lounge’ will have an important role in championing, and introducing customers to, Sandersons’ range of cosmetics and skincare brands. It’s how John Lewis works – shoppers are more likely to buy something they were previously unsure about if the storytelling and customer service is superb. 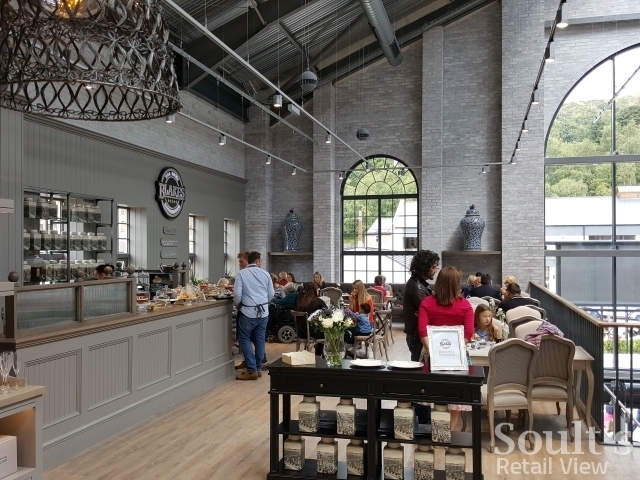 Sandersons’ sense of distinctiveness continues upstairs, where the Blakes tea room occupies a light and airy gallery space off the main mezzanine. 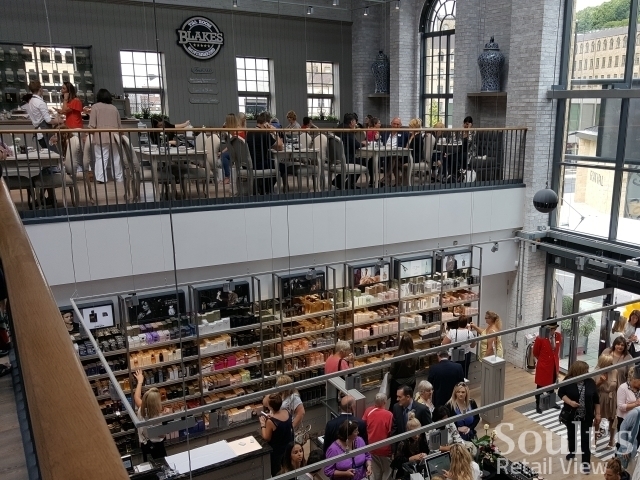 Again, Sandersons has cleverly avoided the common trait of many department stores (and, indeed, other retailers that have instore cafés), where eateries are typically shoved away into a dark corner with a look and feel at odds with the main store. Here, the café is bright, open and visible, and manages to feel like it’s seamlessly part of Sandersons at the same time as recreating some of the distinctive atmosphere that makes the original Blakes, in Newcastle’s Grey Street, such a popular institution. I didn’t have chance to partake of Blakes’ wares on this occasion, but it seemed to be doing a roaring trade as soon as the store opened. 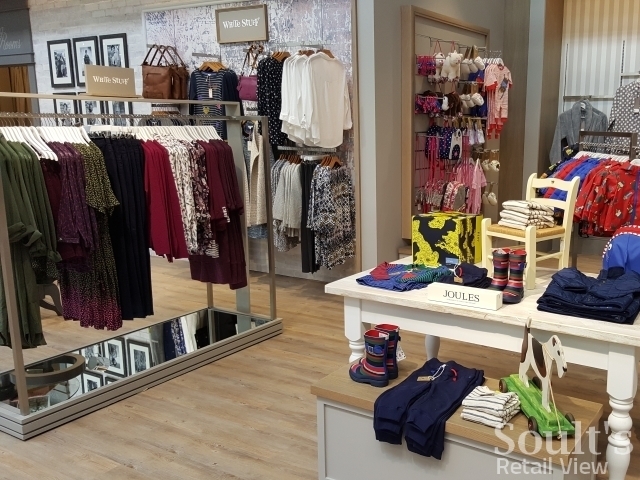 Besides Blakes, the rest of Sandersons’ upper level is dominated by womenswear, as well as some children’s clothing. 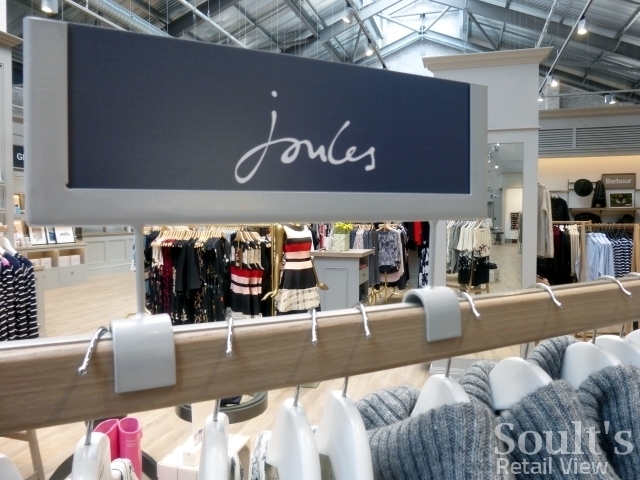 There’s an impressive array of higher-end labels here, such as Joules, White Stuff, Phase Eight and Barbour, plus appealing Danish brands Part Two and Masai. Again, it all seems pitched about right – labels that are not so astronomically priced that they’re inaccessible, but interesting and attractive enough to pull people in to the store. 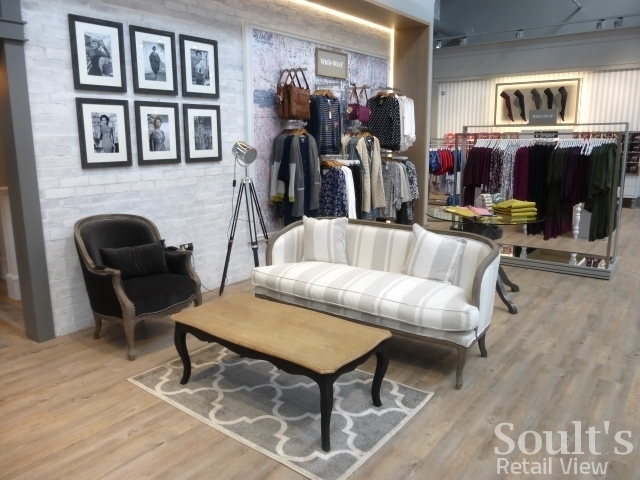 What also works particularly well at Sandersons is that the brands and concessions never overshadow or contradict the overall look and feel of the store. Many of the less attractive department stores that I visit feel like a collection of shops within a shop, with little sense of a coherent story tying everything together. 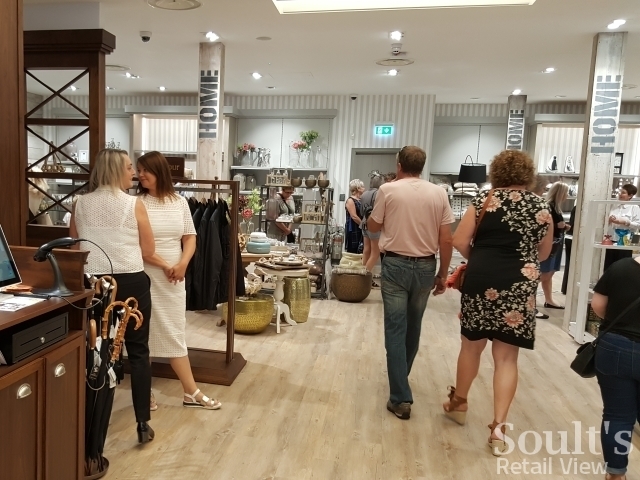 However, by working closely with its brands from the start, Sandersons has managed to curate a much more consistent and enjoyable instore experience. Wisely, the store has a clearly premium positioning that avoids competing in the value space and is more likely to make it stand out as a place that shoppers want to visit. Of course, there are potential sales density implications of giving shoppers plenty of space to move around and the products room to breathe. However, as a nippy independent, Sandersons is in a strong position to make changes instore quickly if there are some ranges that fly off the shelves while others underperform. Instore, Sandersons is far from being boring or samey. Unusual brands, the draw of Armand’s Beauty Lounge, the smart and enthusiastic staff, and simply the fact that it’s a lovely environment to spend time in all make Sandersons a store that succeeds in offering customers an enjoyable experience. Securing the first Blakes outside Newcastle is also a masterstroke – it’s easy to see the tearoom being a draw in its own right, and hence an effective footfall driver for the store as a whole. As for the marketing, both Sandersons and Fox Valley are doing a great job. Both have clear and up-to-date websites, and their social media is engaging and very active. This online presence is crucial, both in engaging with existing and potential customers, and in continuing to build awareness that Sandersons and Fox Valley exist. Indeed, word is certainly getting around beyond South Yorkshire that this is a scheme worth paying attention to. Back in June, I was delighted to see Retail Week run an excellent three-page feature on Full Gas Bikes – Fox Valley’s independent cycling store – helping prove to readers that London doesn’t hold the monopoly on exciting retail interiors and store concepts. As it successfully reinvents the department store for the 21st century, Sandersons is surely worthy of similar acclaim. 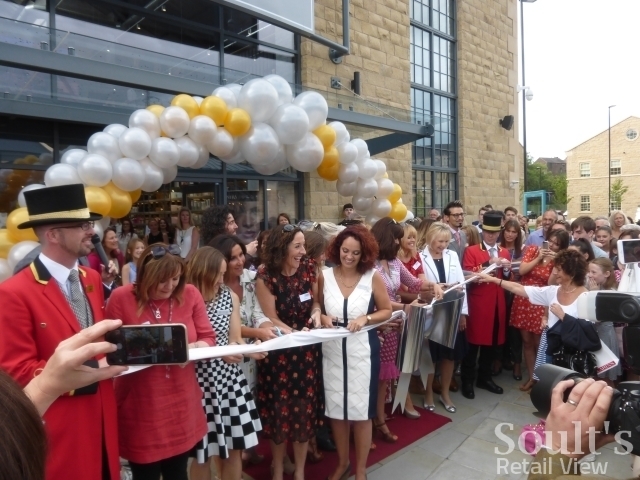 Previous story As Sandersons opens in Sheffield, what should a successful independent department store look like? What a fantastic write up , and absolutely spot on !